Saudi Arabia possesses world-class rock art in a dazzling desert landscape replete with majestic natural formations. 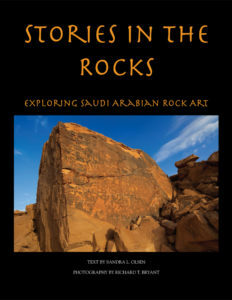 Stories in the Rocks: Exploring Saudi Arabian Rock Art is a beautifully illustrated book written in an easily accessible manner. Its goal is to enlighten readers about the records created by ancient artists on the sandstone cliffs and outcrops distributed widely down Saudi Arabia from north to south. Stunning color photographs by acclaimed photographer Richard T. Bryant demonstrate the value of advanced imaging techniques like Gigapan robotic panoramic photography, night photography, and reflectance transformation imaging (RTI), as well as laser scanning for the recording of rock art. The volume illuminates the lives of nomadic hunter-herders and the many animals they hunted and raised. The petroglyphs also document the spread of the Arabian horse through history; dramatic battle scenes among cavalries, infantrymen, and camel corps; and the worship of goddesses of war and fertility. Clothing, hairstyles, animal coat patterns and breed types are detailed in this compilation of remarkable artistic representations.